There are thousands of nurses and qualified clinical reps in the marketplace. Only a small percentage of these professionals are expert clinicians with the polish of a seasoned marketing rep.
ConsignMed secures and invests in these people, and brings them to you. We combine this focus with our love of science, people, and partnerships to strengthen our ability to build teams. Whether we secure candidates for a new team, or complement an existing team with one individual, people are the center of our specialty. Our brand, Inspire Creative Chemistry, is at the heart of every candidate selection. Our consultants and employees only work for our clients if we would be willing to hire them at our corporate office. Click here to learn more about our brand. Our teams consist of those with experience and the skill set to drive sales and build relationships. Our Nurse Education Program focuses on brand awareness, compliance, and patient communication. Our teams understand the dynamics involved in effectively educating healthcare professionals on new and existing brands. Our people have experience with access strategy and help maneuvering through compliance and reimbursement. With our model you have the ability to expand into new, existing, or outlying territories. We have a proven track record of successfully promoting over-the-counter, prescription, and medical device products across the United States. Our MSL's are key in providing a scientific bridge between biopharma and healthcare professionals. They have advanced scientific training and academic credentials, PA, NP, or PharmD. Our MSLs are experts at establishing and maintaining peer-peer relationships with Key Opinion Leaders (KOL's). Their role pre, during, and post is essential. This non-promotional perspective allows them privileged access to healthcare professionals, and helps maintain trust and credibility. It is vital to ensure these interactions remain compliant and firmly non-commercial. Our teams of in-servicing reps have become experts at working with our clients to ensure hospital staff are properly trained on a product. Our capabilities range from a team of 5 to a team of 75 experienced reps. Our team formulates, implements, and evaluates current procedures for a facility wide in-service program. We work with hospital staff and ensure the master schedule supports the role out. We will also provide and or arrange for facility wide orientation and ongoing training programs/in-service competencies. Following a roadmap for the successful conversion of a product is key. Implementing a conversion in any clinical category can be difficult and complex. We've found there are two components necessary for a successful evaluation and conversion, a clinical focus team and a logistical/supply chain focus team. By working cross-functionally, the two teams will develop and manage the conversion process by identify the opportunity, planning the evaluation, executing the evaluation process, and transitioning to the new product. Our coverage teams are responsible for providing case coverage and technical support in the operating room, surgery centers, or Dr's office. They are able to Identify training needs and non-adopters in assigned accounts and communicate back to the sales rep. They develop relationships with multiple call points during frequency of contact visits E.g. ; Physician, Management, Tech, RN, education, Bio-Med etc. and ensure all product issues or concerns are properly addressed to ensure long term customer satisfaction. In this role we combine the clinical specialist with the service support rep. These specialists understand the importance of building relationships, educating staff, and cross selling against a competitor's product. Having the ability to present the value proposition and the disease state, is what makes these reps unique in this field force support space. This model allows brands to establish/reestablish their value as a source of high quality information, and at the same time provide better service with a broad reach. Are you struggling to hire the best within budget AND manage their time and credentials? We will help you BUILD A CONTRACT TEAM: We cross-recruit experts from within, or recruit new, to serve your team's vision. Each new hire experiences an extensive screening process with the collection of 20+ compliance documents. We leverage volume so YOU CAN AFFORD THE BEST: Engage the best on a pay per utilization basis without exceeding your budget. Not ready for full time help in a particular territory? No problem. Leverage our nationwide, shared resources to fill field needs. Your investment is never lost when you convert consultants to full timers. Let us help you CREDENTIAL: The privileging process can be a heavy administrative burden. 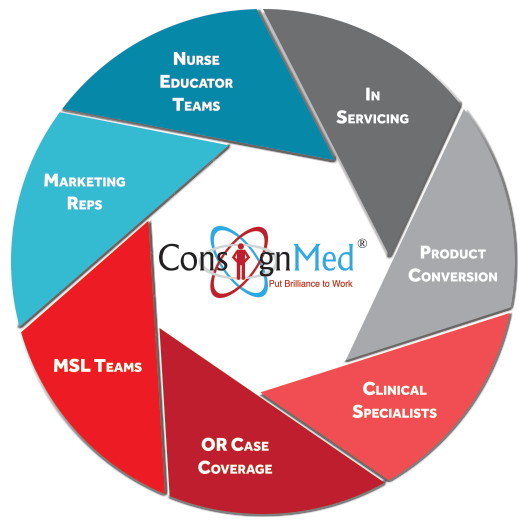 In partnership with medical device and equipment manufacturers, ConsignMed serves field representatives with credentialing solutions. Our multi-phase method is complete, yet customized to accommodate your needs. Spend more time selling and educating your clients instead of managing the red tape. We can help you SCHEDULE: Our visibility to hundreds of nationwide consultants allows us to serve our clients with back-up resources. When your resource is scheduled for another engagement, our team taps into the next available consultant. Ask us about our REPORTING functions: ConsignMed collects and reports custom data. We listened. Created with information collected over several years, ConsignMed has developed a process for reporting secure data back to field management. Make educated decisions with new visibility to field activities. There's MORE? : In addition to our core services, we also offer expertise in on-boarding, regulatory and product training, records maintenance, and more. Your FULL TIME EMPLOYEES need help, too: As an extension of our full service credentialing, ConsignMed serves client employees with a credentialing concierge, also known as Vendor Access. From absorbing fees to updating multiple profiles, ask us how we can serve you, too.